Airbnb is an online network where people can lease or rent short-term lodging in private homes. 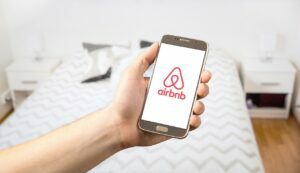 The company was started in San Francisco by two roommates who wanted to “just make a few bucks” by renting out their apartment like a bed and breakfast, hence, the “bnb” part of Airbnb. Today, it is the most popular and fastest growing individual vacation rental website in the world! Almost anyone can be a host on Airbnb, which allows people to utilize their spare homes or rooms to earn extra income. The host sets the price for the space, and renters pay for their visit in advance online. Both hosts and renters maintain profiles with ratings, feedback and general information. This is perfect for those who own a lake home! Lake homes are a great draw in vacation season, and you can earn hundreds of dollars in extra cash by listing your home. Below are some helpful tips for listing your lake home on Airbnb. Find out what local regulations, taxes, licenses, permits and registrations apply where your lake house is located. The governing authorities who control the use and development of property in your area usually have useful information on any such regulations. If your lake home is in a rent-controlled area, there may be stricter rules that apply. Call and ask questions if you aren’t sure – it’s extremely likely you’re not the first person in your area to inquire about renting your home. Some cities and neighborhoods have bans or restrictions on Airbnb, so it is critical you check with your homeowner’s association or Co-Op Board regulations prior to listing your lake house. If your lake home is a unit in a condominium community, check your contract to see if there are any short-term lease stipulations. Consider your neighbors when you plan to host your lake home on Airbnb. When you have guests coming, let your neighbors know so they won’t be alarmed by strange cars showing up in the driveway. This can save you a concerned phone call from your neighbor when they show up, or worse! If your community has a security service, you should also notify them, as well, and make sure your guests have any entry or alarm codes before their stay begins. At least some photos of your property are mandatory on Airbnb. Just some quick shots with your phone will suffice, but make them attractive! You want to not only give prospective renters an idea of what to expect, you also want your home to be desirable. Make sure any messes are cleaned up – and be sure to include some shots of the lake from your property! Leaving a reference sheet for your guests can be very helpful. They should already have your contact number through Airbnb, but leaving it there can make it easier. Local emergency numbers, a backup contact, and other services are a good idea, too. Make a basic first aid kit to keep fully stocked on the premises. The kit should be checked and restocked each time a guests checks out. Make sure there is a fully functional fire extinguisher in the home and that the guests know where it and the first aid kit are kept! Confirm that your smoke alarms and carbon monoxide detectors are fully functioning, and that your lake home meets government safety guidelines for your area. Ensure that you have a clearly accessible fire escape route, too. One of Airbnb’s hosting ideals is cleanliness. Providing a clean and tidy lake home will make your guests feel comfortable from the moment they arrive so they can focus on enjoying their stay and the scenery surrounding them. This also demonstrates you dedication to making your guests feel welcome. Most guests travel light and assume their host will have the basic amenities that a hotel would. Make sure you are fully stocked up on paper goods like toilet paper, napkins, paper towels, etc., and have plenty of clean towels and washcloths. Three to four sets is a suggested minimum to provide for your guests. Also provide basic shampoo, conditioner and soap for your renters. Little things tend to make a big difference with guests’ satisfaction as well. Providing a map of the local area, suggestions for local places to eat and drink and local events and happenings go a long way with Airbnb renters. There are many other ways to maximize your income through Airbnb, while minimizing the impact of guests on your home. With these tips, you have an excellent head start!